Legal protection for whistleblowers living in the world’s biggest economies, the Group of 20, is patchy at best and needs to be strengthened to bolster the fight against corruption. The good news is that G20 leaders meeting in Brisbane in November can help make this happen. Ahead of the Brisbane leaders’ summit, Transparency International Australia is co-publishing the first independent review of whistleblowing laws across the G20, with key recommendations for how G20 commitments can be better focused. 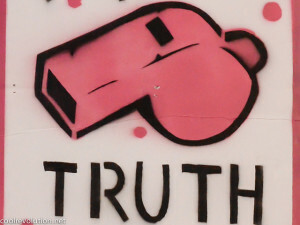 Whistleblower Protection Laws in G20 Countries: Priorities for Action is a collaboration between Blueprint for Free Speech, Griffith and Melbourne Universities and Transparency International Australia, and has involved Transparency International’s G20 chapters worldwide. The report zeroes in on why whistleblower protection remains a vital issue for the anti-corruption plans of G20 governments. It finds that private sector whistleblowing rules are much weaker than public sector laws – despite the growing consensus about the role of whistleblowing in good business governance, “smart” regulation, and identifying and managing financial stability risks. As recently as April, the Financial Stability Board – the international watchdog – recommended that financial institutions everywhere must have “appropriate whistleblowing procedures” along with other “mechanisms … for employees to elevate and report concerns when they feel discomfort about products or practices”. The world’s Business 20 leaders are also calling for a strong, focused anti-corruption plan under which G20 governments give incentives to companies with “leading practice” integrity and anti-corruption compliance programmes. Good whistleblowing systems are an obvious priority in any such programme. Fortunately the G20’s official anti-corruption working group, chaired in 2014 by Australia and Italy, seems to be listening. At the conference Corruption, Integrity Systems and the G20 – hosted in June by Griffith University and Transparency International – Australian government representative Kieran Butler confirmed that when it came to ongoing, unfinished priorities like whistleblower protection, it is not a case of “out with the old, in with the new”. Welcoming the final review, Italy’s co-chair, Stefano Mogini, has expressed total agreement with the “importance of placing the issue of whistleblower protection in the right frame, as it encompasses both public and private sectors”. In fact Australia is not only host of the 2014 G20 summit, but a perfect example of what needs to be done. Its public sector whistleblowing regimes are relatively strong by G20 standards, yet its private sector rules are so weak they fall into the bottom half of the G20 group. 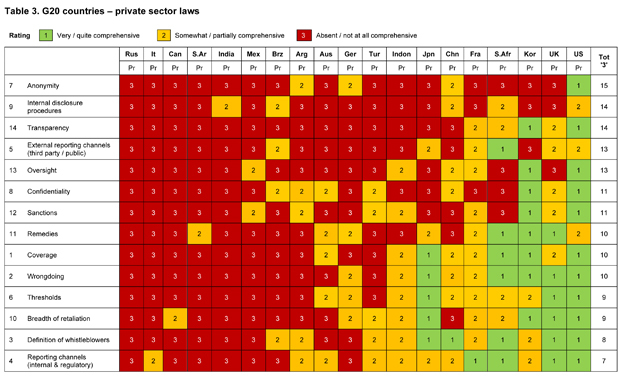 Private sector whistleblowing laws in G20 countries. Fortunately, all the Australian government needs to do is accept this year’s Senate Economics Committee recommendations on corporate regulation, and set in motion a process for a best-practice approach. Worldwide, the new assessment has reinforced Transparency International’s position, and strengthened civil society (C20) support for making whistleblower protection a G20 priority, as noted in the C20 Summit’s final communique. Transparency International is advocating G20 leaders in Brisbane make commitments to set a new direction on whistleblower protection as part of a determined effort to combat corruption. Other key asks include cracking down on anonymous shell companies and better anti-bribery law enforcement. It’s time to walk the talk.